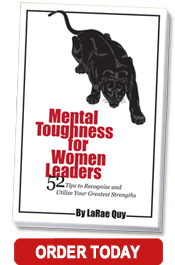 Mental Toughness for Women Leaders: 52 Tips To Recognize and Utilize Your Greatest Strengths empowers women to grow as leaders so they can break down obstacles, make crucial decisions, and find ways to move forward when conditions are not perfect. Most references to mental toughness imply we bulldoze our way through roadblocks that threaten to derail career goals. But mental toughness has little to do with physical strength or aggressive behavior; instead, it is understanding how to control the way your mind thinks. 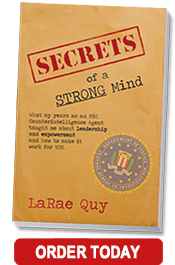 In Mental Toughness for Women Leaders, former FBI undercover and counterintelligence agent LaRae Quy shares how she created a strong mind by overcoming obstacles she encountered while at the FBI Academy, working in a male-dominated environment, and recruiting foreign spies to work for the U.S. Government. As an FBI agent, LaRae believes that while theory is nice, evidence is better when you are serious about looking for ways to achieve goals in life. She relies upon science-based research and real life experiences as she explains how you can clarify your goals, take practical steps to make them happen. and connect with your ultimate purpose. Have you ever found yourself in a situation where you needed to be stronger willed? Do you want to find better ways to overcome the obstacles in your life? If the answer is yes to either of these questions, this is the book for you. We will all face adversity of different kinds this year, and the way in which we embrace it will determine the direction that life takes us. The plans we have for life frequently get derailed with hardships and disappointments. Former FBI agent LaRae Quy spent over twenty years working as an FBI undercover and counterintelligence agent. Her job was to identify foreign spies who were operating in the United States, find out what they were stealing and stop them, assess whether they possessed the type of information the U.S. needed, and if they did, find ways to persuade them to work for our government. LaRae shares the skills needed to survive as an undercover agent. We may never need to talk ourselves out of a desperate situation with criminals or spies, but getting people to trust us is important in business and personal life. She reveals how the same tools she used in the world of spying and counterintelligence to survive in environments of hostility, deception, and fear can help us navigate through the confusion and duplicity we find in relationships, investments, and business. Secrets of a Strong Mind shows how we can view failure and obstacles as opportunities to earn new problem-solving skills. With real-life stories, practical exercises, and inspiring tactics, Secrets of a Strong Mind teaches the skills needed to survive and take full advantage of life. LaRae provides the tools for excavating the significance of our own stories and memories to help us uncover the unknown about ourselves. This discovery will be a new strength. The learning process will not fatigue us; instead, it will invigorate us. This enables us to keep our eyes on the goals and not on the obstacles. I have been following LaRae Quy’s teachings on mental toughness because I want my leadership skills to advance to the next level and prepare myself to make decisions in high stress situations.